Hilton in Myanmar has been recognized once again for its continued commitment to corporate social responsibility (CSR) at the recent 2018 AMCHAM CSR Excellence Awards. Hilton received the achievement award along with a silver status distinction for winning the title for three consecutive years. 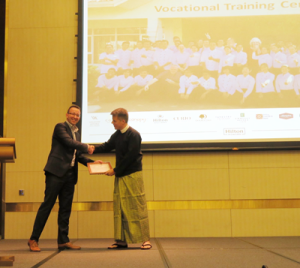 Hilton has been awarded for its pioneering capacity-building initiative, Hilton Vocational Training Center, which provides free training for young people who are keen to pursue careers in hospitality and tourism. The award ceremony took place during the AMCHAM-hosted Thanksgiving luncheon in Yangon on 20 November.